This is a clean simple CV template that uses the classic Garamond font. Although there's no horizontal lines dividing up the different sections, soft grey vertical lines help add emphasis to the various parts of the CV. A few additional sections have been added such as Interests and Hobbies - these aren't compulsory and you can either replace them with sections appropriate to you (such as 'Professional Memberships') or delete them if you would rather not complete them. It's also easy to change the font if Garamond isn't your favourite - just go to Select > Select All in Microsoft Word and pick your new font from the drop down menu. CV template with a simple layout, using the Garamond font	Overall rating:	4	out of 5 based on 5	reviews. Clean, neat and tidy, there's nothing cluttered at all about this smart CV template that uses vertical grey lines to break up your information. The lines expand as you fill in more details, allowing you to easily add as much info as you'd like to give your prospective employer, without any design limitations. Your personal details are arranged neatly at the top for your employer's ease of reference, and your name uses a bigger font to ensure your application stands out from the pile! With so much competition for every job vacancy, job seekers have to work extra hard to make their CV and cover letter stand out from the pile. Recruiters spend just a few seconds skimming over CVs and filtering them into a ‘yes’ ‘no’ pile, with the no pile quickly finding its way to the shredding machine. So how do you give yourself the best chance of making it to the right pile? The number one rule is to remember that your recruiter is looking to see if you meet the job specification so the right information needs to be visible from a quick glance. These include advice on what to do if you don’t meet the exact job specification. Recruiters skim read CVs so don’t even try to make them trawl through paragraph after paragraph of text to find key facts – they just won’t bother. As a Legal Secretary in a busy commercial property department, I typed to dictation, completed a range of commercial property forms and completed all file administration appropriate to commercial property transactions. It is immediately obvious you have the skills required by the job, without the recruiter needing to thoroughly read the paragraph under the bullets. 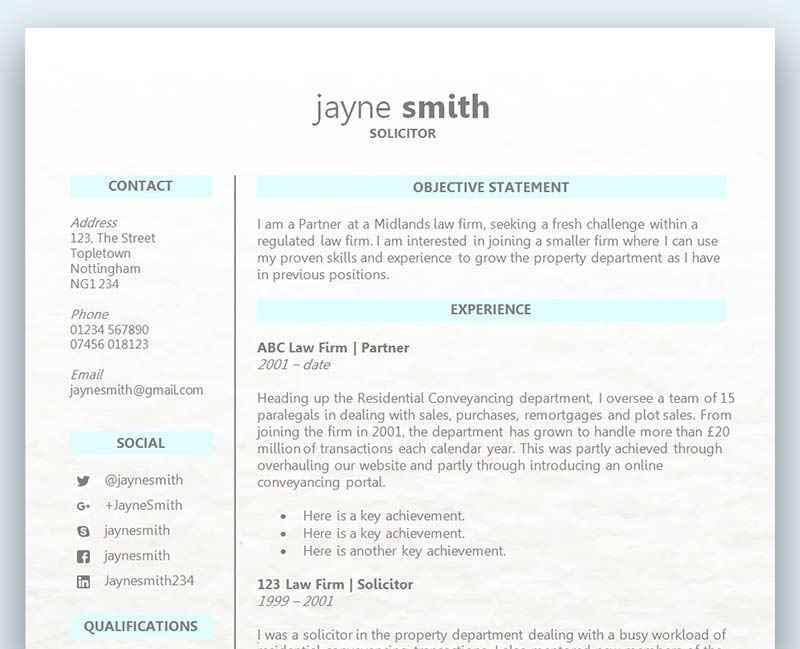 I am a Legal Secretary with 3 years of experience in a busy commercial property department. I have a good working knowledge of all aspects of property transactions and can complete all typing and administrative aspects. I am looking for a full time role within a solicitor’s firm in any department. You should tailor each objective statement to the role you’re applying for. Note that the objective statement may be labelled either ‘objective’ or ‘personal’ statement – both mean the same thingand this is a matter of your own preference.